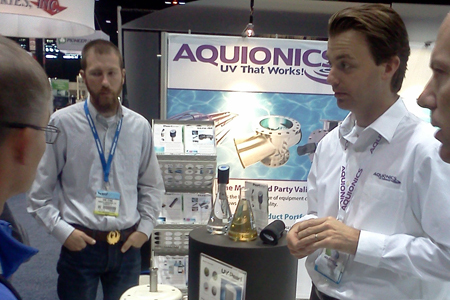 Dan Shaver, Business Development Manager at Aquionics, talks about the advantages of UV-LED technology for disinfection: low energy requirements, chemical-free and customizable design, and proficiency in solar or battery-powered applications. Water Online Radio: Tell us about Aquionics. What do you do and how do you serve your market? Dan: For the last 30 years, Aquionics has provided competitive UV-based systems. Right now, we have a little bit of a shift going on. We have a brand new product coming out that’s focused around UV-LEDs, which is a hot spot in the UV industry in general. There’s a ton of innovation in the field right now, and the road ahead looks really positive. Water Online Radio: Let’s get into a little more detail on these UV-LEDs. Why is it a hot spot? Dan: With LEDs, there are a lot of advantages. LEDs have been on the horizon for a long time, and we are happy to say that they are now readily available. The technology encompasses everything from UV disinfection equipment to instrumentation, and we have a great product roadmap ahead. One thing that gets people interested in LEDs is the fact that they’re not necessarily geared towards applications that a traditional UV customer would use. It opens up the door for applications and end users who may not have initially considered UV disinfection because it didn’t make sense with mercury based systems. There are certain advantages that LEDs have over a mercury lamp. Water Online Radio: What does UV-LED technology do compared to a mercury lamp? Dan: One of the biggest differentiators here is the environmental component. A mercury-based lamp obviously has mercury in it. UV-LEDs are completely mercury free. There is no metal content and there are no special requirements when it comes to disposal. If there was a break in the system, there’s no risk of a hazardous impact such as mercury in the water. When you turn on a mercury lamp there is a warm-up period that occurs. LEDs have the ability to turn on and off instantly. You can do that as many times as you want without affecting the light source. There are very low power requirements compared to what a mercury lamp would require to come up to full power. Also, with a mercury lamp, there is really only one design. LEDs are much more customizable because you have this long cylindrical space requirement where they can be configured in a variety of different ways. That’s where our approach comes in with regard to innovation. Water Online Radio: You talked a bit ago about new applications that couldn’t be addressed before that now can. Go back to that topic and talk about who should be looking at it; folks who probably never even considered UV-LED technology and could totally be unaware. Dan: We are seeing interest from military applications where they are looking at deploying UV disinfection into the field where a mercury-based solution would not necessarily do the job because there is a risk of the lamps breaking. When you look at some of these purification systems that are mounted on the back of Hummers, you need a system that can handle that environment. Mercury might not make sense here, but LEDs certainly do. Also, UV-LEDs work for solar or battery-powered applications. This opens up the door for remote applications and humanitarian or disaster relief uses. Water Online Radio: You’ve talked about benefits such as customizable geometric configurations and such, but what are the cost considerations? Dan: The industry for UV-LEDs is still fairly new. We are currently working with UV-LED suppliers as the cost comes down and the efficiencies go up. It helps us communicate good price points to our customers. The products that we have out on the market today are competitive. We are able to do that because we have put years of development into this. We have put a lot of research efforts into the design of the LEDs, how we cool them, and what the reactor looks like. All of these things contribute to end cost, but we have positioned it in a way that is competitive. Water Online Radio: Is there an ideal size of operation that fits your wheelhouse or do you fit any size market?